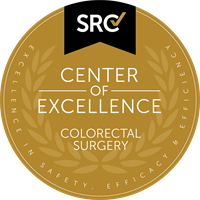 Bayfront Health Port Charlotte is the first in the state of Florida to have achieved accreditation as a Center of Excellence in Colorectal Surgery by Surgical Review Corporation (SRC). A Center of Excellence in Colorectal Surgery accreditation distinguishes Bayfront Health Port Charlotte from many other facilities by providing the highest quality of care to its patients as determined by an independent, external process of evaluation. Status as an accredited Center of Excellence in Colorectal Surgery means Bayfront Health Port Charlotte along with board-certified colon and rectal surgeon Domingo Galliano, Jr., M.D., FACS, FASCRS, have met nationally recognized standards. Not all healthcare organizations or surgeons seek accreditation; not all that undergo the rigorous on-site inspection process are granted accreditation.